ArmInfo. Reforms in the field of corporate financial reporting will lead to increased transparency and confidence building among business entities. Such an opinion was expressed by the director of the World Bank office in Armenia Sylvie Bosutho on the margins of the March 5 working conference "Improving the quality of auditing by ensuring quality control of audit activity". 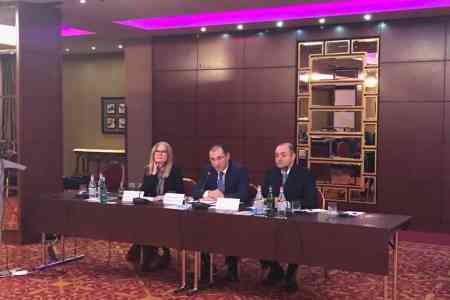 As Armenian Finance Ministry Vardan Aramyan noted the department aims to increase the competitiveness of local companies by maintaining the proper level of financial reporting and accounting. According to the head of the Office, Armenia's economy should be oriented to the future - to become more competitive, export-oriented and ready for investment. In this context, the role of planned reforms in financial reporting and accounting is important. "The planned activities will not only ensure the competitiveness of companies, but will also increase confidence in local businesses, thereby contributing to the process of attracting investment and access to finance," said Silvi Bosutho. According to Vardan Aramyan, the financial reporting area of the accounting is permanently in the focus of attention of the Armenian government. The logic of the Ministry of Finance's actions is simple: if the government plans to develop export-oriented directions of the economy, it should focus on the growth of companies that claim to participate in global markets. To do this, first of all, it is necessary to ensure the competitiveness of these organizations, which requires competent and accurate financial management by maintaining the proper level of financial reporting and accounting. At the same time, according to Aramian, the government also has something to work on. "It is impossible to lay all the responsibility on the shoulders of just one business, and at the same time expect to increase the competitiveness of local companies," he said. That is why, as the head of the Ministry of Finance pointed out, starting in 2008, the agency jointly with the World Bank (WB) initiated radical reforms in the sphere. The beginning was established by the establishment of a number of rules and standards - in 2013, the Strategy for Action in the field of accounting and audit was approved. Already in 2017, the Armenian government developed and approved a strategy for reform in the sphere. With the support of the World Bank, the Armenian Ministry of Finance studied the world experience, consulted with specialists, carried out certain calculations in order to identify the mechanism that will ensure the formation of proper level of financial management and accounting systems and financial reporting. For these purposes, the Ministry of Finance, according to Vardan Aramian, aimed primarily at reviewing the approaches to mandatory audit. The philosophy is that, as the minister pointed out, companies with public significance and a significant role in the economic life of the republic should be subject to mandatory audit. "They should have social responsibility to the society - to show that financial management is conducted correctly, and the reporting is reliable and reliable," Aramyan said. He reminded that for today audit is mandatory for open joint-stock companies (LLC). If this LLC does not function or does not function fully, the strict application of this rule becomes impractical. Proceeding from this, the Ministry of Finance plans to reconsider its approaches on the basis of the role assigned to the company in the economic life of the country. In addition, as Vardan Aramyan noted, the government, setting an imperative on compulsory audit, should not forget about ensuring a high level of services provided by auditors. For this, a control system should be established. Having studied the market, the Ministry of Finance has identified two models of qualitative regulation of the sphere: the state itself controls the quality with its own resources, and the second model for the formation of an accredited structure that has all the necessary tools in its arsenal, assigning qualifications to the auditor in the future will be responsible for the quality of the services it provides. In general, as the head of the Ministry of Finance noted, the agency is aimed at reforms in four main areas - legislation, education, the system of passing the improvement of professional skill of the personnel and trainings. "The goal is to create a platform in accordance with international quality standards," said Vardan Aramyan.